How to adjust the water temperature on both gas and electric water heaters if their thermostats aren't marked with numbers. The US. Department of Energy recommends setting your water heater temperature at 120 degrees Fahrenheit to save both energy and money. If your gas or electric water heater has a dial with numbers, it's easy to set it to 120 degrees. Most water heaters, however, don't have this feature, so you'll need to check the temperature manually. Decrease scalding risk by installing anti-scald devices or anti-scald faucets on showers and baths. Anti-scald devices also can be used to protect sink faucets or all hot-water fixtures in the home. Gas water heaters feature one thermostat located near the bottom of the tank on the gas control valve. 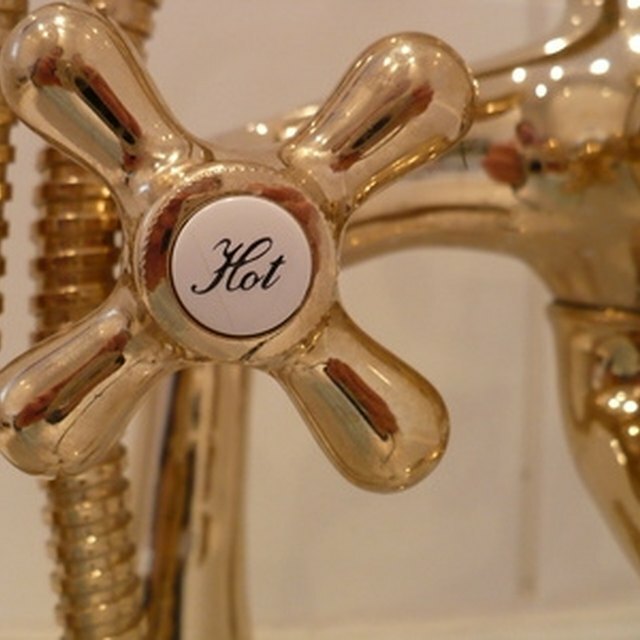 If the heater doesn't have a thermostat marked with numbers, check the water temperature by [running the hot water](http://wwwfamilyhandymancom/plumbing/water-heater/how-to-adjust-hot-water-heater-temperature/view-all) at the closest bathroom or kitchen tap for a minimum of three minutes. Fill a glass with the hot water and check the temperature manually using a thermometer. If the temperature is below 120 degrees, turn the temperature up on the water heater. Wait for three hours and repeat the process again. If the temperature is still below 120 degrees, turn it up again. If it's above your target temperature, turn the temperature down. Continue with the process until you reach the desired temperature, and then make a mark on the water heater's thermostat so that you'll always know the location of the 120-degree setting. Electric water heaters typically have two heating elements, one in the upper third and one in the lower third of the water tank. Each element has its own thermostat controlled by an adjustment screw. The screws are concealed behind a metal cover and a flap of insulation. If the adjustment screws do not have a temperature dial, the temperature-adjusting process involves the same manual test as with a gas water heater. [Shut off the electricity](https://www.youtube.com/watch?v=y15D1Xbt_EU) to the water heater by turning off the appropriate circuit breaker in your home's service panel (breaker box). Remove the metal access covers on the water heater. Verify that the power is off using a noncontact voltage tester. Adjust each thermostat by turning its adjustment screw with a screwdriver. Turn clockwise to raise the water temperature, or counterclockwise to lower the temperature. Replace the insulation and metal cover. Restore power to the water heater by switching its breaker back on. Manually test the water temperature. If it needs further adjustment, repeat steps 1 to 3. Do not restore power to the water heater without having the metal covers in place.